Descending the trail from Heart Lake late in the day, we kept running into backpackers. First a young couple, moving at a fast clip. Next, a woman who clearly struggled, greeting us with a wry smile on her face. All of them carried state of the art backpacks, hugging their backs, made of lightweight material. Then a middle-aged man came trudging up the trail. His backpack looked nothing like the other hikers we had come across. In fact, he looked more like a gypsy peddling his wares. A metal frame jutted over his head. The material looked dingy and well-worn. Hanging off the metal frame was an assortment of items. A sleeping pad was tied to the bottom, a cook pot tied to the side. Tent poles jutted off the other side, and sneakers dangled by their laces from the back. Correction, a sneaker hung off the bottom of the frame. Where was the other sneaker? We would soon find out. As we continued down the trail, we ran into two college-age girls. “Are you with the man up front?” we queried. She held up the dusty running shoe as proof. 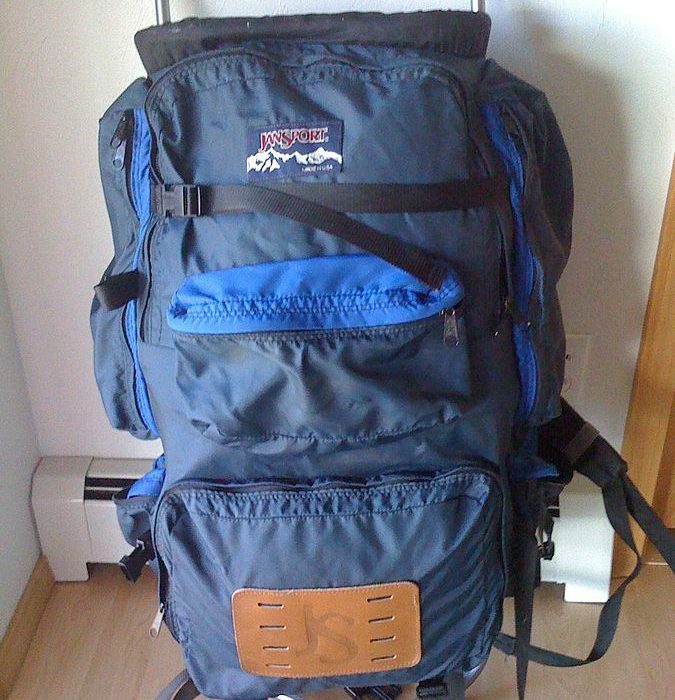 Back when I first went backpacking about 30 years ago, I too used an external frame pack. Until about 25 years ago, external frame packs were the only kind of backpack. The construction looked like a small mattress frame with a rectangular piece of fabric attached to the middle. The idea was to carry most of the weight above your head, supposedly making it easier to haul a lot of weight. Since there was so little interior space, most of the bulky stuff like tents, sleeping bags, pads, cookware had to be tied to the frame. Thus the look of a gypsy peddler. As gear technology evolved, internal frame packs became popular. The flexible frame is built into the pack inside and the pack hugs your torso, providing a more secure fit and better balance as you climb rugged terrain. As innovative fabrics have been developed, these packs have gotten lighter and lighter and the fit has become more precise. They also provide plenty of room inside the pack, so that all your gear can be stowed securely in the interior. Most of these packs include a built in “reservoir” pocket to put your water bladder so you can drink while your hike. Plenty of compression straps allow you to fully compress your load both vertically and depth-wise, making the gear easier to carry. I for one would never go back to that old external frame pack. Very few companies even make them anymore as they are part of a dying breed, as internal frames have taken over the market. But every now and then, you run across an old school hiker who refuses to give up his pack, because as one told me “It still works.” He’s usually the same guy wearing flannel shirt and big heavy leather boots with red laces. You know the kind. Let’s just hope he doesn’t arrive in camp missing half his gear that fell along the trail.